I'm hopeful that this beta maybe doesn't cause constant lagginess and freezes. The beta is pretty good/stable for me now. Use it on my main phone no problems at all. For me the the change from iOS 10 to 11 is pretty insignificant in terms of features tho. I've been waiting on Apple Pay p2p and AirPlay 2 as far as the main new features ... still unseen. As far as an update goes, this is -- by far -- an iPad-centric release. But when will this FINALLY be released?? During the week of the keynote?? Or after?? 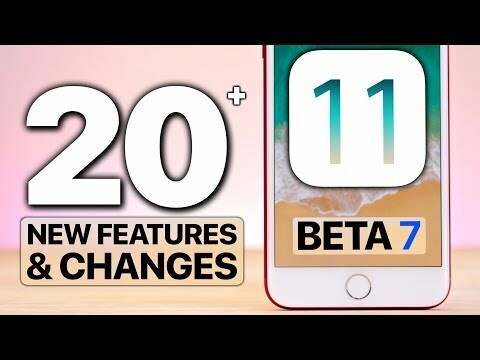 For the discerning tech nerds YouTuber EverythingApplePro (4M subscribers) always publishes a video detailing the most minuscule changes between betas, and the video is usually up within 24 hours a new beta is released. The subtle changes discovered give subtle insights into the principles (and sometimes lack there of) Apple designs UI/UX with. Great stuff. AppleInsider covers the big changes (which anyone can just pull off the release notes), whereas EverythingApplePro employs forensic methods to find seemingly unnoticeable changes. Isn't the public beta still stuck on 6? I haven't seen any updates for that. I love the betas once a week. I wonder why the change over waiting a fortnight between updates. I've noticed issues with the previous beta on Mac OS with the reliability of the WiFI subsystem. In fact just before this download I had to reboot. Locked up so hard that even diagnostics would not finish. Otherwise things are looking really good, in fact it is snappy. I'm actually liking the betas which frankly even with a few glitches are more reliable than Windows at work. It generally has been every two weeks in the past unless they have something exceedingly bad happening. Frankly I need at least two weeks between release to pick up on some of the more obscure bugs. The funny thing here is that I've seen very few bugs that I can really help out with in the High Sierra betas. Ha! I wonder if this once-a-week release is a new Apple marketing strategy... Get some hidden new features out there -- so some enterprising developers can dig them out and pre-announce them! Are you running APFS on a Fusion Boot drive? I tried that a few betas ago on my early iMac 27 5K -- and it took over a week of long trial-and-error sessions to make it right without APFS. Really a hassle -- starting the 5K in target disk mode to an earlier iMac -- had to buy a FireWire to USB adapter, and put up with a lot of other crap. When did they finally say that APFS was working with Fusion? Public beta 7 is out. What do you mean by emphasizing FINALLY? iOS releases are pretty routine. They're released after the September event. Never before. I did not see any notice that it was not working. Especially Maddining because it defaults to use APFS and the checkbox is covered by a dialog box. • HDD-only Macs cannot be converted to APFS. • Some iMacs with 3TB Fusion drives and BootCamp may be unsupported for use with APFS. • APFS support for Mid 2012 Mac Pro will be included in an upcoming seed. • Resizing APFS containers is currently not supported in Disk Utility. • Workaround: In Terminal, use the diskutil tool to resize APFS containers. • Encrypted APFS volumes can’t be decrypted. Decryption support will be added in an upcoming beta. • The X11 window manager cannot be used on APFS formatted installation of macOS. • Systems may panic during app installation. To me it seemed like everyone was saying not to even try APFS if you didn't have a single volume, Apple SSD. Though, I am not using Bootcamp -- I'm MS Free... Yea! "Keeping up with the one per week cycle"
How fitting. Goes along with the "once per week" cycle of Android malware in Google Play (for those not aware, another round of 300 Apps got removed for taking part in a coordinated DDoS attack). Apple does however get it released about a week before the next iPhone ships. I assume this is to try and alleviate stress on Apple's servers a little with everyone activating their phones and running any updates for them at the same time as everyone updating to iOS 11. The videos posted on Youtube, show that beta 8 is markedly slower than 10.3.3 in booting, app launch, general benchmarks. Especially on older phones. The iPhone 6 is really crippled in that sense, and it is by no means a "slow" phone, considering the changes are mostly graphical, at least from what I see. I have a saddening feeling that they are optimising the code for 7, 7S (8) and "forgetting" either willingly or not, older but still perfectly usable hardware, for the latest and greatest. Forcing then in a way, people to upgrade. Which is quite contrary to their policy, which is an excellent one, to provide latest iOS versions for several years, contrary to what happens in the Android world. Moreover, APFS is not really mentioned by anybody as working properly on Fusion Drives and if Time Machine will finally work more intelligently and faster using delta updates at block level, rather than copying the whole file. As far as I know, APFS seems to be working only on single drives and that's it....and if you upgrade a drive to APFS, it will simply add a layer on HFS to implement APFS, but will not really change the structure of the drive. Meh.